Talking like a pirate is the bane of my existence. As someone generally recognized as a guy who’s “really, really into pirates”, as the host of a fairly sizeable annual Talk Like a Pirate Day Party, and as DJ of a weekly pirate-themed radio show, folks pretty much expect me to “talk the talk.” Problem is, I generally don’t. The core element to what’s widely regarding as “pirate talk” is essentially a mix of gutteral throat scratching combined with maritime words and a shameless knack for “hamming it up.” But sadly, I’m not by nature a ham. What’s more, common pirate impersonations don’t work well on the conversational level, as everything must be an enthusiastic exclamation. This may work fine at parties or festivals, but if you need to actually convey detailed information (as pirates surely did from time to time,) then one needs to find a way to actually – not yell, not growl, not utter – but yes, TALK like a pirate. Easier said than done, in my book. Fortunately for us all, it’s not my book that’s being reviewed (actually, I have no book. The book I refer to in the previous paragraph is merely a figure of speech. 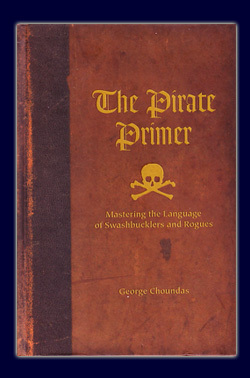 Sorry to disappoint), but rather the much more helpful Pirate Primer: Mastering the Language of Swashbucklers and Rogues by George Choundas. In the broadest sense, there are two ways to talk like a pirate. The first is much in line with my above descriptions – the alpha-personality, gutteral, slightly-constipated sounding sort of hearty bellows well suited to barbecues, parties, or picking up chicks at pirate bars. Books have been written on this, and The Pirate Guys – founders of International Talk Like a Pirate Day – have turned this method of speech into high art. But as stated, it’s not for everyone, nor all situations. The second way to talk like a pirate – and the one addressed in this very book – is more involved. It’s much more difficult to master and requires considerable study and practice, but is by far the more authentic and versatile in the end (and less obnoxious over an extended period of time.) It involves the careful application of dialect mixed with pirate slang and a sort of sentence restructuring dubbed by the author as “wrong talk.” More on that shortly. This book is a whopping 470 pages, and is layed out for reference more so than beginning-to-end reading. The lion’s share of this tome lies in Part I: What to Say. Broken down into sections based on usage (greetings, threats, oaths, toasts, contractions, etc. ), it consists of thousands of words and phrases, their meanings, suggested various pronunciations, and an example quote from historical, literary, or cinema sources. The second, smaller half of the book, Part II: How to Say It, tutors the reader in the finer arts of dropping vowels, double and triple negatives, repetitions, and all the other structural sins one must embrace in order to sound like a pirate, fair and true. This also be wheres the subject of wrong talk be addressed, it is. And accordings ta Choundas hisself, ye must master this ‘ere art if ya ever hope ta ring yer clapper like a pirate, or devil take ya fer a spaniard! Throughout, The Pirate Primer maintains a human, conversational tone. Even though it’s structured like a dictionary, it would be no great challenge to read each section beginning to end like a novel. But therein lies the crux, as reading this book – or any other book for that matter – could never be enough to make you talk like a pirate. 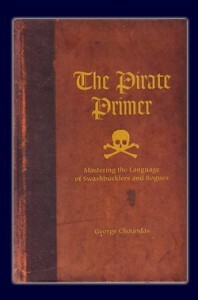 Purchasing The Pirate Primer (something you really, really should do if you have an interest in learning this remarkable skill) is only the first tiny step in a very long road. Personally, I think I’ll need to purchase two more copies – one for the car during traffic, one in the bathroom, and my current copy by my bed. Read a small segment each day, and try to use it in daily life – your friends and family will surely learn to hate you, but this too is the pirate way. And in time, you’ll begin to develop a true conversational pirate ability that will sound remarkably authentic, culturally rich, and swaggeringly disrespectful. And the next time your buddy is looking sleepy at a pirate party, you can yell, “Smite me fer a guppy, thar be more life in me little finger than in all yer carcass!”, which will surely leave all witnesses speechless and awe-struck. This entry was posted in Books and tagged bilgemunky's favorites, choundas, self-help, talk like a pirate by Bilgemunky. Bookmark the permalink. HELP! Do you have the version of this book that has actual holes in the pages & around the edges of the pages that look like burn holes? With really cool pages that feel old, like quality parchment paper? I know someone who has an edition like this, and I tried to buy it but all the ones I find are hardcopy, but they have smooth pages with only printed holes & printed tears at the edges. I really would love to know where I could find the antique, aged looking one with the rough, parchment-like pages & actual “burned” holes in it. Or do you suppose my friend had a special copy? It is really a high-quality book with much attention to details. It looks like it came from the printer/publishing company with the burn holes & sort of ripped-edge pages–I don’t think it was something that was customized after he got it. I’ve never seen it before, & I can’t get hold of my friend at the moment. Any help would be SO appreciated–it’s a wonderful book–not like anything I’ve ever seen. Thanks for any information! Captain Sunny Fox – I’m afraid I don’t know the answer to your question. I have two copies of this book, and both are the smooth edged with printed tears style. I’ve relayed your question to George Choundas, the author of Pirate Primer, figuring he should know the answer if anyone does. I’ll let you know if I hear anything, or perhaps he’ll be able to answer your question directly. I just heard back from George Choundas, and he informs me that the publisher only produces the smooth page version of the Primer – this is the only version commercially available. BUT, this isn’t the first he’s heard of people taking the Primer and “hyper antiquing” it by hand. Sounds like this is what your friend did. That, or someone modified it and then sold it to him on the after-market. Me new favorite book says I. Twas’ a fine read and shall be used fer ref as it wer. HA HAR!! !